With the rising shortage of skilled workforce in agriculture, there's a growing need for robotisation to perform labour-intensive and repetitive tasks in greenhouses. Enter SWEEPER, the EU-funded project developing a sweet pepper-harvesting robot that can help farmers reduce their costs. The ongoing SWEEPER project builds on CROPS (Intelligent sensing and manipulation for sustainable production and harvesting of high value crops, clever robots for crops), a previous EU-funded project. The CROPS software modules based on the robotic operating system is maintained and expanded in SWEEPER. In addition, the gripper end effector is retained. SWEEPER improved on CROPS' pepper harvester technology by building in sensors and advancing algorithms to improve the localisation of fruit and the detection of fruit maturity, as explained on CORDIS. "The robot can now detect obstacles and can calculate a collision-free path to the fruit, allowing maximum free space to grip and cut off the fruit." The project team also plans to add a conveyor belt and harvest trolley to the SWEEPER system and automate post-harvest fruit and vegetable packing logistics. The SWEEPER (Sweet Pepper Harvesting Robot) project's main objective is to "put the first-generation greenhouse harvesting robots onto the market," its website explains. It addresses some of the issues that growers face in the greenhouse sector, including labour costs, availability, food safety and quality. Project partners expect the commercial sweet pepper-harvesting robot to be available within a few years. They also anticipate that the technology will be transferred to other crops. The SWEEPER team notes that further research is needed to make the robot work even faster and reach a higher harvest success rate. The project brings together a wide range of disciplines. 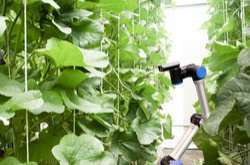 These include horticulture, horticultural engineering, machine vision, sensing, robotics, control, intelligent systems, software architecture, system integration and greenhouse crop management.